So I cannot believe that it is Friday, once again! Holy heck this week just zoomed by! "This blog is for women from all walks of life to write stories about women, share what they are doing with/and for women, and educate each other about what is happening to women and girls around the world. We encourage all visitors to read, learn and comment. We also encourage you to check out our SOON TO ARRIVE donations page and encourage you to help. We do not take donations ourselves – only provide links to sites where you can choose to help women from around the world. We do not make any money from linking to these sites. In fact, if you know of a good women’s charity that you think would be great to add to our lists, please let us know." Awww thanks for the shameless advertising for SHEmagination. 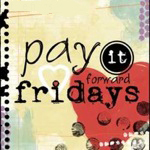 I hope the pay it forward finds many people helping women and their families around the world! Yeah!!!! Microloans are a good idea, and a nice way to contribute even if you don't have a lot of money. great site!! love your blog! This is a great site, and I think it will just keep getting better!! !